Will zipping your dog into a Shed Defender make him look like a canine fool? Sure. But no more so than putting him in pet samurai armor or an AT-AT costume for your personal viewing pleasure. 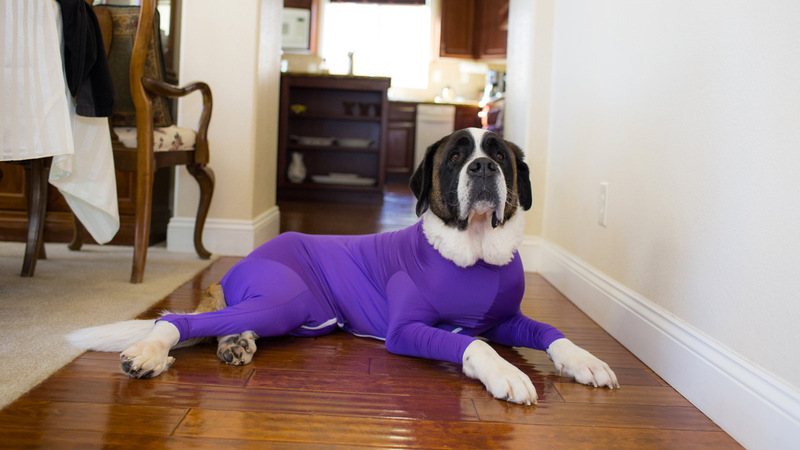 And while the latter have only aesthetic benefits for you as dog owner, Shed Defender says it has several health benefits for both you and your onesie-clad pooch. Tyson Walters originally developed the Shed Defender for his St. Bernard, Harley, who was shedding like a...St. Bernard...all over the place. After a few iterations based on the first one his mom sewed for Harley, Walters felt he'd perfected the cut and fabric for a leotard-like suit that would contain the dog's fur effectively for the owner, and comfortably for the dog. When dogs wear a Shed Defender, the fur that would normally spread from their coat to your carpet, couch, and car seats remains locked inside the suit. So too do any canine allergens and dander. If you're having guests over with fur sensitivities, or just don't want to vacuum out your car every time you take Darby to the dog park, a Shed Defender is a pretty easy and cheap way to quarantine the problem. For the dogs' part, Shed Defender says its design can help reduce anxiety and related barking, I think in a way similar to weighted blankets for humans. The onesie is like an all-over doggie hug that can have a calming effect on nervous pets. Additional Shed Defender benefits include keeping freshly groomed dogs clean while they're outside in the rain, dirt, or mud, and providing some warmth and protection from fur freezing in the snow. Protection extends to flying insects, ticks, and stickers while hiking / camping too. Finally, if your dog has a skin irritation, wound, or surgery stitches, the Shed Defender can take the place of the dreaded cone, covering the wound or site to curb licking and scratching.